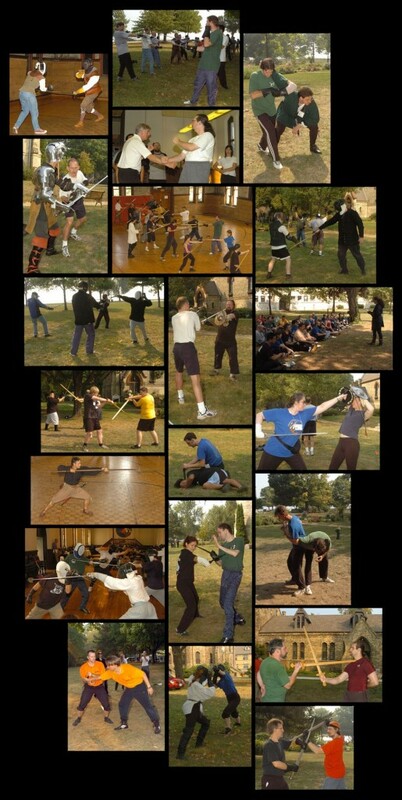 Begun in 1999, and hosted bi-annually by the CSG, the Western Martial Arts Workshop is now the premier North American event for hands-on study of Historical European and American Martial Arts. As the oldest annual gathering of students, the Western Martial Arts Workshop was born out of nothing more than three far-flung friends wanting to meet face-to-face. Pete Kautz of Alliance Martial Arts, Col Dwight McLemore of The School of Two Swords and Greg Mele of the Chicago Swordplay Guild had “met” on-line and had begun a fruitful email and phone correspondence. At Pete’s suggestion, they each began exchanging videotape of their training sessions as a way to share drills and techniques and to critique each other’s work. They expanded this idea to include other Western martial artists, and see if they were interested in attending. By the time the event occurred, the “little get together” had mushroomed into eight instructors and over forty total attendees, Dave Cvet of AEMMA’s last minute decision to attend even making it an “international” event. Since then, each WMAW has tried to further develop and expand the original concept. WMAW has become a four-day, martial arts retreat, drawing approximately 200 students, playing host to an instructor list from three continents, and providing classes for all levels of student, the Western Martial Arts Workshop provides the best series of classes, collegiality and research available in the Western Arts today. You can keep abreast of updates and announcements for the next workshop and see hundreds of photos and class schedules from previous years at the official Western Martial Arts Workshop website. Be sure to sign up on the WMAW mailing list so you don’t miss out!